Use this wizard to log in to your Google Analytics account and authorize Analytics Edge to access your data. Enter a name for the account you want to login with, then click the Add Account button. Multiple accounts can be stored, and you can change which account gets used by default. If your reports make multiple queries and always refer to the ‘Default account’, you can switch the default account to report on on different account. Select an account from the list, select a web property and view, and click Make Default to set that view to use as default for that login. Use the ‘Save Default in Macro’ button to force a specific workbook macro to always use a specific account as the default. If you experience a problem with the login, click the Manual link in the dialog. A new browser window will open. Login to your Google Analytics account and Accept the access request. 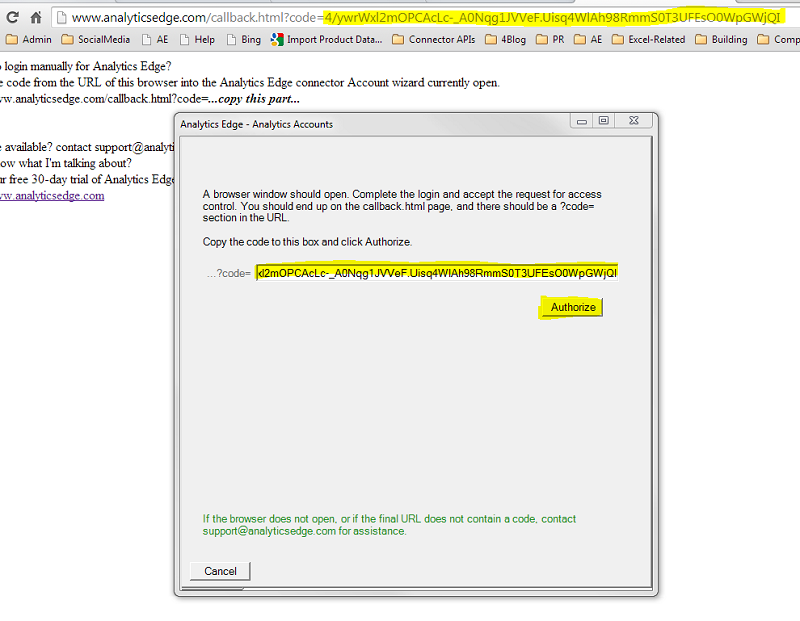 You will be taken to a web page on the Analytics Edge web site, and there should be a code in the URL of the browser. Copy the code part of the URL, close the browser, and paste the code into the dialog box provided. This entry was posted in Google Analytics on 2014/06/23 by functions.